Everyone has a stake in the company’s success – act like it. Previously, learning was either largely limited in the classroom or focused on specific needs. But with the disruption of virtual communications, repositories and databases that enable instant delivery of learning experiences, and a growing demand for real-time learning – we are now able to meet business needs and deliver a consistent employee development experience due to rapid business advances. This evolution puts L&D professionals in a strategic position to serve as a partner and advisor to organizational executives and leaders, given the constant shift in demands and need to integrate fully into the organization. But how do those professionals who’ve been deemed “training leads,” and merely there to only develop skills or deliver a one-time solution, step out of that shadow into a more strategic light to drive a learning culture? Someone who is asked to regularly weigh in, or provide advice into key decisions (related or unrelated to their work) – often in advance. Someone who adds value to areas of the business beyond their current role. Someone who grows and fosters relationships outside of their core programs or immediate projects. Someone whose personal brand is strong – they often speak at events, are asked to write articles, or take on critical business projects. Overall, the outcome of being a trusted advisor will allow L&D professionals to deepen customer and stakeholder relationships and provide more insight and development of high-impact solutions. This can also result in higher satisfaction at work and in one’s job when they are treated and seen as a leader in their space – both inside and outside of the company. Here are the five cornerstones with tactics that will help any learning partner or HR professional get a seat at the right table. 1.Develop a strong personal brand. Continue to grow one’s reputation and voice through a personal brand, both internally and externally. This means every event or social media post can help shape the perception people have of an L&D partner. If stakeholders respect one’s work and value their opinion, doors will continue to unlock for input into processes, improvements and, importantly, future roles. Get to know others in the business. Likeability is a huge factor of influence, so build one’s network accordingly. Attend events. Seek opportunities to attend external events and present on any innovation or lessons that others can learn from in the community. Additionally, write a blog or post, share or tweet articles, or research to drive thought leadership in the space. Be aware of your behavior. Be genuinely passionate, enthusiastic and authentic when working with team members. They can feel the energy when it’s genuine. 2. Listen intently. When invited to meetings and opportunities to learn about current business needs, listen to your leaders and the team’s problems. The main skill to build is how one reinforces what they heard, comes up with a viable solution or alternative, and finds a way to succinctly share that with leadership. What does the client need? Aim to look beyond the surface needs and understand a leader’s underlying interests. Ask to get involved in planning meetings to provide updates. Attending business-critical meetings can give insight into upcoming changes that may shift the leaders and L&D program goals. Provide the right program recommendations. In order to gather the information needed to provide practical program recommendations, continue to keep an eye on leadership priorities, and talk to the learners about what the growth areas are for the team. Additionally, never assume training is the solution. Ask questions around “What’s the reason for this request,” or thank someone for the insights or request. But before accepting the assumption, ask for time to investigate whether the skill or knowledge gap really exists. One way to pipeline constant feedback is by asking questions in pre-existing surveys such as “what areas do you want to grow next year?” Or when in meetings, use natural discussions to listen to the pulse of the learners so you know what is top of mind while in critical business meetings. 3. Communicate effectively. This applies to any situation when an L&D professional refers to their roles or introduces oneself. Think about instances of providing program updates to teams, or meeting someone for the first time and telling someone about one’s position. It’s important to not describe oneself as a “trainer” or “learning developer,” but rather a “consultant or advisor to the business” who enables performance. The reality is, L&D professionals understand human behavior and ways to drive performance through learning activities, reinforcement and unlocking a team’s potential through various methods and structured programs or materials. How an L&D professional describes themselves does matter, and it shapes the brand going forward. Create a 30-second pitch around one’s role and team to ensure the right message when meeting new people in the business. Create a mission and vision with the larger L&D team in one’s business for how the group will grow as advisors together. 4. Be vocal. When seated with leaders, provide recommendations for business or process improvements, even if it has nothing to do with your job. Trusted advisors are willing to speak up and give their thoughts no matter what the topic. As a partner to the business, everyone has a stake in the company’s success – act like it. Build relationships. Growing one-on-one relationships to ensure trust across teams at all levels will help make oneself more confident to be open and honest about views. Offer recommendations. Position recommendations with collaboration and business growth in mind. Speak up. Be transparent on views with the business’ best interest in mind. This will grow credibility. 5. Always keep learning. Continue to learn about the business as a whole in order to be a true thought partner and advise on areas outside of your role. Take time to learn about things outside of your job. Bonus: It makes everyone more well-rounded and confident when engaging with senior leaders. Ask for your leader’s yearly and quarterly priorities. Knowing what is top of mind for them will allow you to ask the right questions in meetings or all hands. Another way to do this is to watch the company earnings calls and read annual reports since they often highlight current areas of strength and parts of the business that are being invested in (or not). 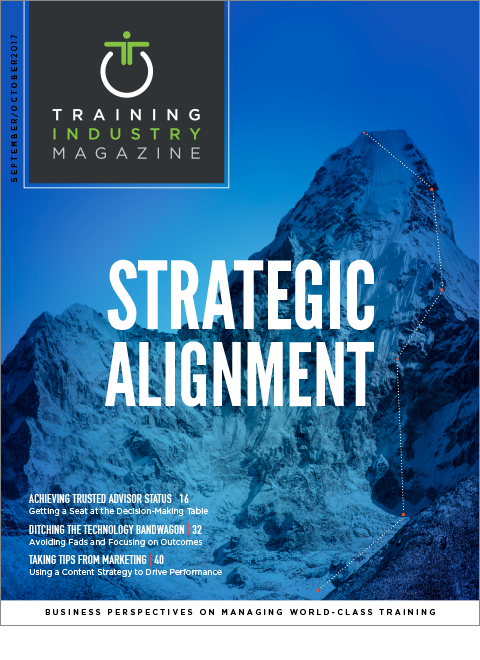 Stay on top of the industry and market trends. This will help any L&D professional stay well rounded as a person but also in one’s business’ area of expertise. This can be done by enrolling to receive email digests from articles or notable news sources, searching for keywords on social media channels for the latest articles, or googling news updates on any topic. Which area resonates as a place to begin? There’s nothing to lose! If leveraged correctly, the tactics provided can start to shape new opportunities to sit at the leadership table with organizations to provide a human-centered development approach and share input on the business decisions. The result of doing so can allow L&D professionals to glean insights on rapid changes to the business, and ensure a continued investment in employee development. As all L&D professionals collectively grow the brand as trusted advisors to businesses, there will be stronger relationships across L&D and the business, as well as a global brand of consultative advisors. Embrace the opportunities presented or go seek them out today – step out as a trusted advisor. Tiffany Poeppelman is a regional sales performance consultant within sales readiness at LinkedIn. She oversees the development of the Marketing Solutions EMEA (Europe, Middle East and Africa) sales teams in over seven countries, and the global emerging business around the world.